Muffin pan, holds 6 muffins or cupcakes. 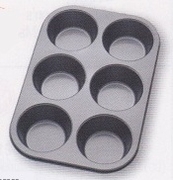 Professional quality, carbon steel base provides even baking. Premium non-stick coating allows quick release of the baked goods. PFOA free. Pan measures: 13" x 8-3/4"